The single statement that stuck out to me the most at the Lore and Story Q&A panel this year was one sentence uttered by Dave Kosak: "There's something about Azeroth that is unique within the cosmology, and there's a reason that it's kind of the focus of this." It doesn't really seem all that important, does it? Not in the face of a Pandaria expansion, not when we haven't even got a major villain to address. But this started an avalanche of speculation in my mind, and I traveled down a road that's been traveled before -- one that was easily dismissed, before that statement, and before everything quietly snapped into place. 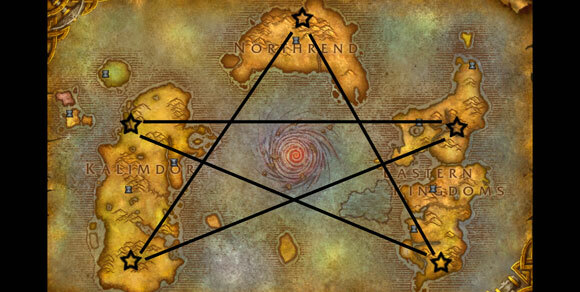 There's a reason we're going to Pandaria, there's a reason why the Sha have exploded onto the scene with our arrival -- and there's a reason the Alliance and Horde are at war, and it has nothing to do with Theramore or its fate. There's a reason the Pandaren are vitally important, and it isn't silly at all. But let's back away from that for a little while. We'll get to that a little later. Right now, let's talk H.P. Lovecraft. Today's Know Your Lore is a Tinfoil Hat edition, meaning the following is a look into what has gone before with pure speculation on how it happened. These speculations are merely theories and shouldn't be taken as fact or official lore. H.P. Lovecraft was the author responsible for the Cthulhu Mythos story cycle and the Necronomicon -- a fictional grimoire of magic rites. His works involved what he called "cosmic horror," often exploring themes of forbidden knowledge, stories of malevolent gods of chaos and destruction, things man was not meant to know. Lovecraft's work is some strange, strange stuff (and well worth the read if you're into creepy horror), but more importantly, Lovecraft's influence has leeched into Warcraft beginning in vanilla and continuing to today. The stories of Old Gods definitely have their roots in Lovecraft's work. One thing that we've never been certain of is just how many of these Old Gods exist. Take another look at the map above -- I've referenced it more than once, and I've always said there seems to be a reason that everything lines up. I think I've got that now, to a degree. The answers lie in a curious box found through archaeology, the Puzzle Box of Yogg Saron. It references the number seven: "Have you had the dream again? A black goat with seven eyes that watches from the outside." There are a few different ways you can interpret that statement, one of which is that we're dealing with seven malevolent entities, not five as previously thought. That ... actually sounds about right, given what we've been presented with so far. If you look at the map correctly. Ready? Let's begin at the beginning. C'thun / Cthulhu In the Lovecraft mythos, Cthulhu is a being devoutly worshipped by cultists and is supposedly the source of mankind's constant anxiety at a subconscious level. C'thun is an obvious reference to Cthulhu based on name alone, but if you take a closer look at the way C'thun operates, it's a similarity on a much deeper level. Cthulhu was responsible for anxiety. C'thun's temple is full of such cheery quotes as "You will die," "Your friends will abandon you," "You are already dead," and others. Each specifically addresses the listener; each plants a small seed of doubt, of anxiety. So the correlation is absolutely there, without question. Yogg Saron / Yog-Sothoth Yog-Sothoth again bears the same name similarity to Yogg Saron as C'thun and Cthulhu -- and again, that similarity runs on a far deeper level. This outer god exists simultaneously in all of time and space, and because he is linked with everything, he sees all and knows all. Anyone who has ever fought Yogg Saron in Ulduar will doubtless remember the brain room of the beast, the room where we were shown visions of past and future, visions that still aren't fully explained. But the visions themselves are an indicator that Yogg Saron sees far more than we mere mortals do, which does demonstrate that Yogg Saron is definitely Yog-Sothoth's counterpart. N'Zoth / Zoth-Ommog This was the Old God I was completely stuck with, both for correlation purposes and for location on the map. There have been theories abound that suggest N'Zoth's closest correlation is Nyarlathotep, another being in the Lovecraft mythos. I don't think that theory is right -- and there's a good reason for that, bear with me. But I do think that for name purposes, N'Zoth is likely correlated to Zoth-Ommog, a creature that really hasn't been expanded upon in the Cthulhu mythos. Zoth Ommog is the third son of Cthulhu in the Lovecraft mythos, but there really isn't a lot of information out there about him at all. Oddly enough, we don't really have a lot of information about N'Zoth, either, which is what makes this correlation so difficult. So assume for the moment that perhaps that lack of information on the Old God is because we have a lack of information on his source. Though it is sometimes assumed that N'Zoth is responsible for Deathwing's corruption, in reality all we know is that he is responsible for the Emerald Nightmare. That was the only connection discussed in various lore panels. This would logically set N'Zoth over in Kalimdor, near Teldrassil, the World Tree he corrupted. That leaves the question of who is responsible for Deathwing's madness. And what about those other two spots on the map? Who are they? For that, we need to take another look at the Puzzle Box of Yogg Saron. It's a puzzle, yes -- it's a puzzle from a creature that knows everything in existence. The phrase Have you had the dream again? A black goat with seven eyes that watches from the outside, if taken in parts, could be construed as two references: one, there are seven malevolent entities that watch over us; two, the Black Goat is a clear reference to Shub-Niggurath, often associated with the phrase "the Black Goat of the Woods with a Thousand Young." 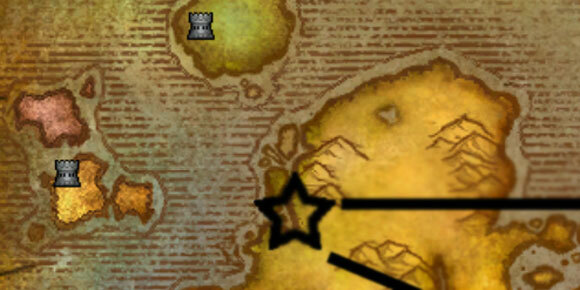 It's unclear what spot this Old God would take on the map or its purpose -- but then again, we haven't seen it yet. Yogg Saron, on the other hand, exists in all space and time, so he doesn't particularly care one way or another if something exists yet or not. He could throw that information out there, but it wouldn't make sense -- perfect material for a puzzle box. The other reference, spot five on the map, is even less clear. There are plenty of references to night and plenty of creatures in Lovecraft's work associated with it. There is also the line Look around. They will all betray you. Flee screaming into the black forest. There is a creature in the mythos that fits that as well: Lythalia the Forest Goddess. It's a big old unknown at this point, and we won't know until it's actually introduced in game at some point in the future. Spot #6 is the one that I'm pretty certain about. In the land of Ny'alotha there is only sleep / In the sleeping city of Ny'alotha walk only mad things / Ny'alotha is a city of old, terrible, unnumbered crimes. This is where we learn more about Nyarlathotep. ??? / Nyarlathotep Unlike the other outer gods in Lovecraft's works, Nyarlathotep serves a distinct purpose. He isn't one of the outer gods in the usual sense; he's their herald, their messenger. He watches over the cults of the outer gods while those gods are away. And where the gods and great ones are creatures of mindless and ravening destruction, Nyarlathotep is clever, deceptive and manipulative, and he delights in cruelty. He enacts the will of the outer gods, and he delights in causing madness. This sounds like a pretty likely source for Deathwing's corruption -- far more likely than N'Zoth. More importantly, it may very well be that this was the voice Azshara heard as she plunged into the depths of the ocean, her palace crumbling around her. The city of Ny'alotha, a city of old, terrible crimes could be referring to the War of the Ancients, a name for the sunken remains of Azshara's former palace. But Nyarlathotep's corresponding Azerothian representative is not the one responsible for her transformation. That's far more likely a result of the one being that he serves over any other and the seventh spot on the map. Can't see that seventh spot? Oh, it's there. Right in front of you. Follow me to page two -- there's something wholly unsettling I'd like to introduce you to.